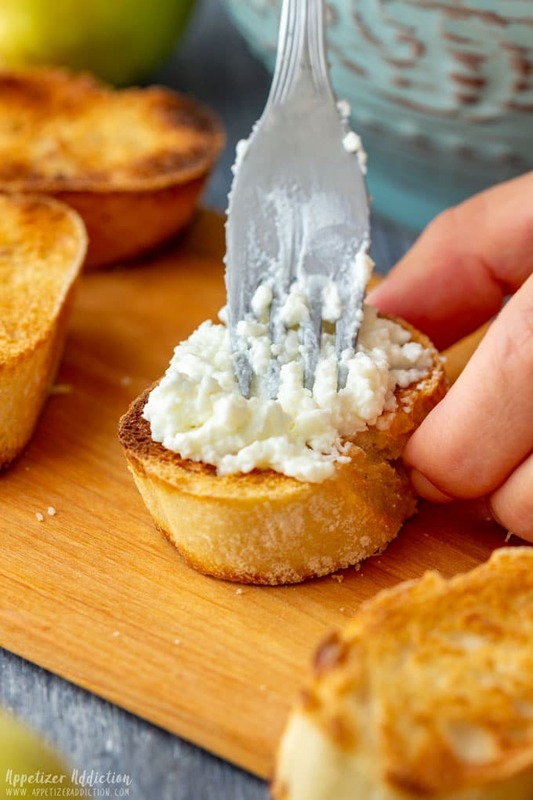 Pear and goat cheese crostini are an easy appetizer ready in 20 minutes! 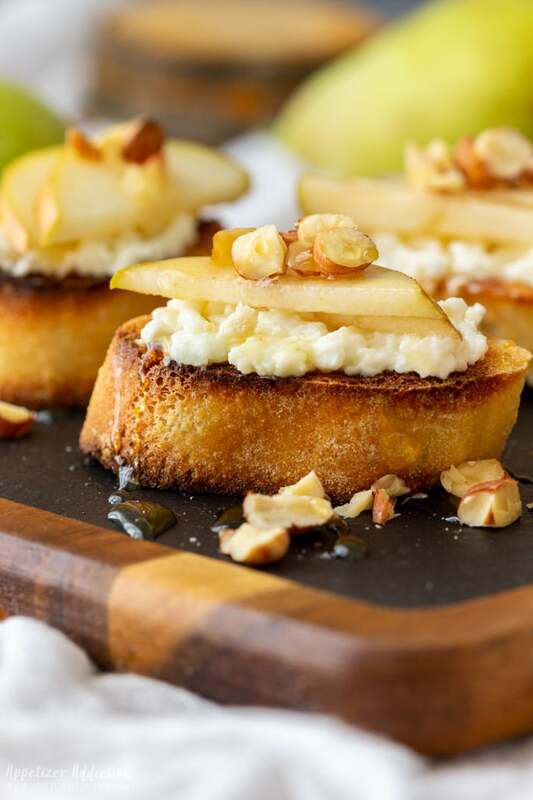 Crispy bread is topped with cheese layer, slices of pear, crushed nuts & drizzled with honey. If you want to impress your guests at your next party, make these pear and goat cheese crostini! Finger foods are perfect because they cater for guest with different tastes and diets. You can keep everyone happy by making what they like. 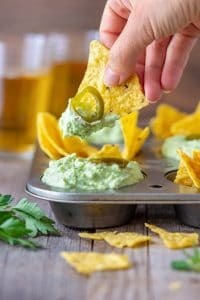 Bite size food is so easy to make and in most cases quick! 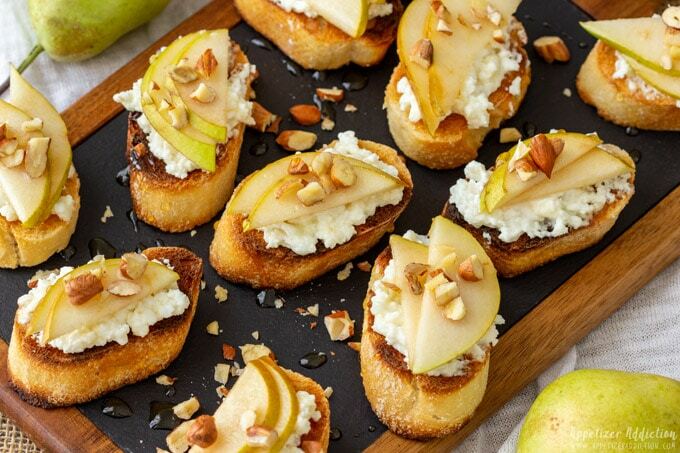 Try these pear and goat cheese appetizers to see for yourself! 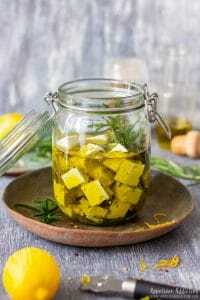 Easy recipe – if you love simple finger food recipes that are easy to put together, this is it! Quick to make – some easy recipes take a lot of time to prepare but this is not the case. 24 crostini toasts are ready in less than 30 minutes. 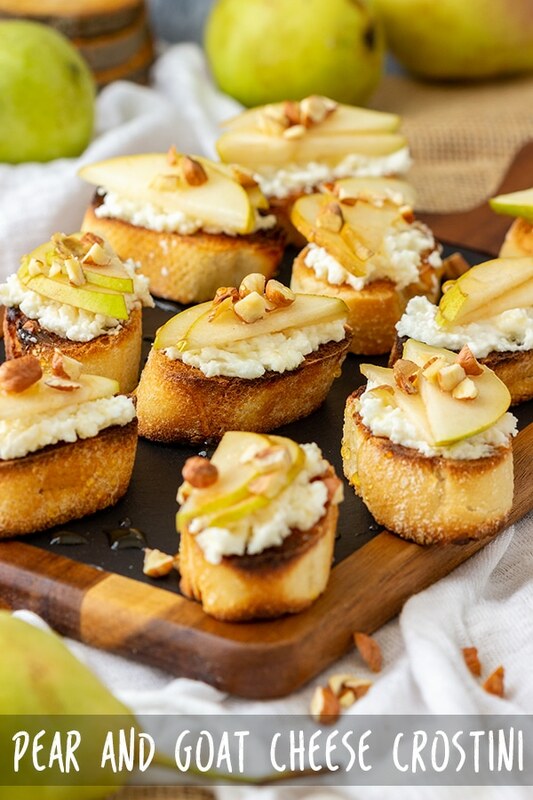 5 ingredients – is all it takes to make these pear and goat cheese crostini. Balanced flavors – not too sweet not too salty – just perfect blend of flavors! Perfect for any occasion – fancy birthday party, family gathering, DIY wedding reception, Thanksgiving dinner, Christmas or New Year’s party …. Plus no oven needed to make them! 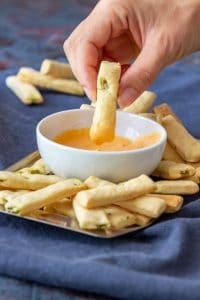 Serve them with Potato Leek Soup Shooters, Parmesan Asparagus Pastry Twists or 5 minute Artichoke Heat Dip. 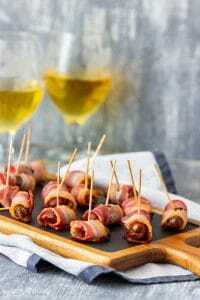 All these easy appetizer recipes will definitely be a hit at your party. The traditional way of making crostini is by baking them in the oven. This is not my favorite way to make them though. I just throw them into my toaster and wait until they pop out. If I feel they need to be in longer, I adjust the time. It’s the easiest and quickest way to make them! First, toast sliced bread. Like I’ve already mentioned, using the toaster is the quickest and easiest way and works so well. It takes me about 2 minutes to toast 6 slices. Your time might be different. This will depend on the size of your toaster and also on the doneness of the crostini. You might like less crispy so you can reduce the time or increase. This is completely up to you. Meanwhile you can prepare the cheese mixture by combining goat cheese and ricotta cheese in a bowl until smooth-ish. Rinse the pears and cut them into quarters, lengthwise. Remove the seeds as well as any hard parts. Then slice thinly. Last thing to prep is roughly chopping a few hazelnuts. Toast + cheese + 2 pear slices + drizzle of honey + crushed hazelnuts. A day old French baguette is perfect for making pear and goat cheese crostini toasts. The bread should not be sliced too thin or too thick. If it is too thin, it might not be able to support all the ingredients you want to use. ½ inch to ¾ inch is the perfect thickness. Thick slices might be difficult to eat. Crostini toasts taste best when prepared just before serving. The longer they sit at a counter, the soggier they get (this will depend on the choice of toppings as well).The easiest way is to toast the bread slices ahead and add toppings just before the party/gathering is about to start. If you think you can’t manage, I guarantee you that you can (unless you need to make about 100 of them that is). Assembling 12 pear and goat cheese crostini takes only about 6 minutes, 24 crostinis = 12 minutes. That is pretty do-able, right? How many canapes should I serve per person? In general, count with 3-4 canapes per person for a 4 hour party, if other food is served as well. If you are not planning on serving other snacks or food, increase the amount of canapes to 8 per person. 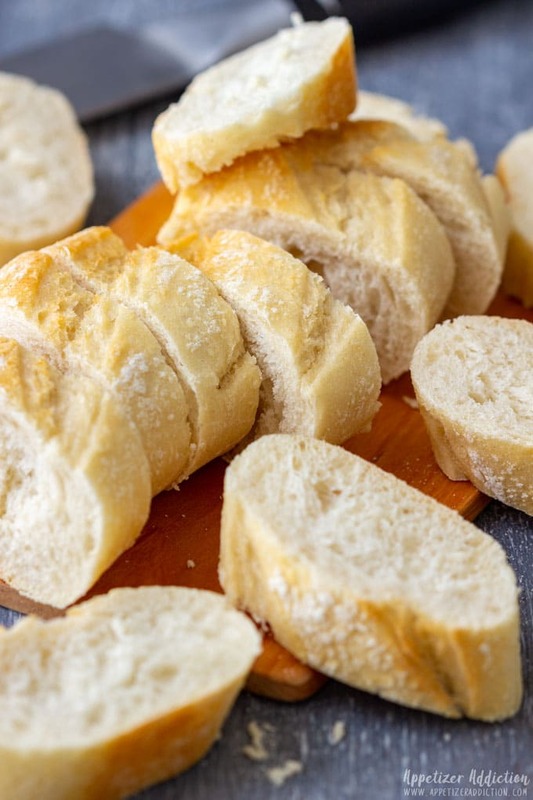 Cut the baguette into ½ inch – ¾ inch (1.5-2 cm) thick slices. Toast them using a toaster until they look to your liking. Don’t burn them. 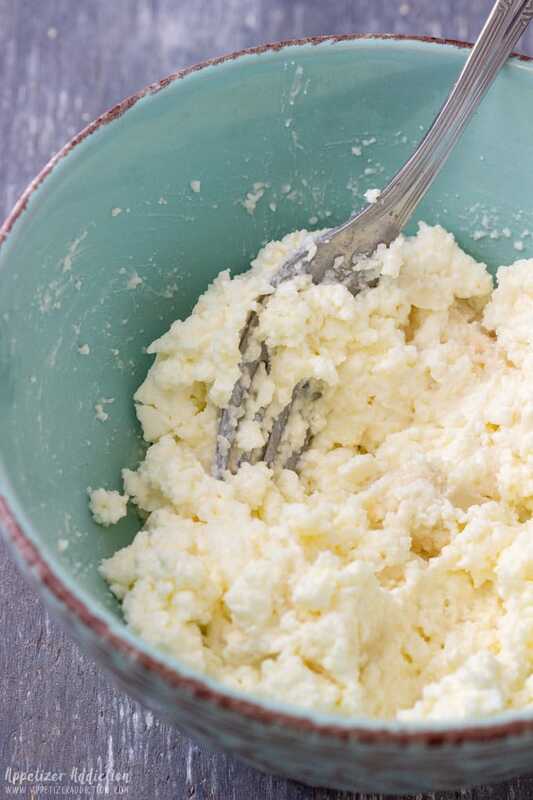 Meanwhile: Prepare the cheese mixture by combining ricotta and goat cheese in a bowl (use a fork to mash it). Rinse and pat dry the pears. Cut them into quarters lengthwise. Remove the seeds and any hard parts. Slice each piece thinly and set aside (see note 4). Roughly chop the hazelnuts. 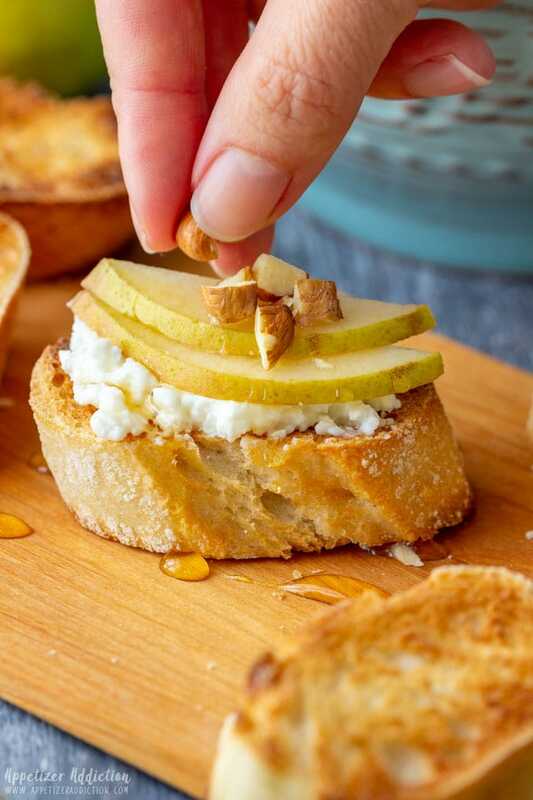 When the toasts are ready, take one slice, spread some cheese mixture over, top with 2 pear slices, drizzle with honey and top with hazelnuts. Repeat until all the crostinis are ready. You might need to increase/decrease the number of canapes per person. This will depend on the size of the appetizers, length of the party, type of the party. If there will be other food or snacks served, you can decrease the amount of canapes per person. This recipe yields 24 pieces and counts with 4 pieces per head. A day old French baguette is better for making toasts. The cooking time = the toasting time. This time might vary slightly. If you have a large toaster you might be able to toast more of the crostinis in one go which will save you time. 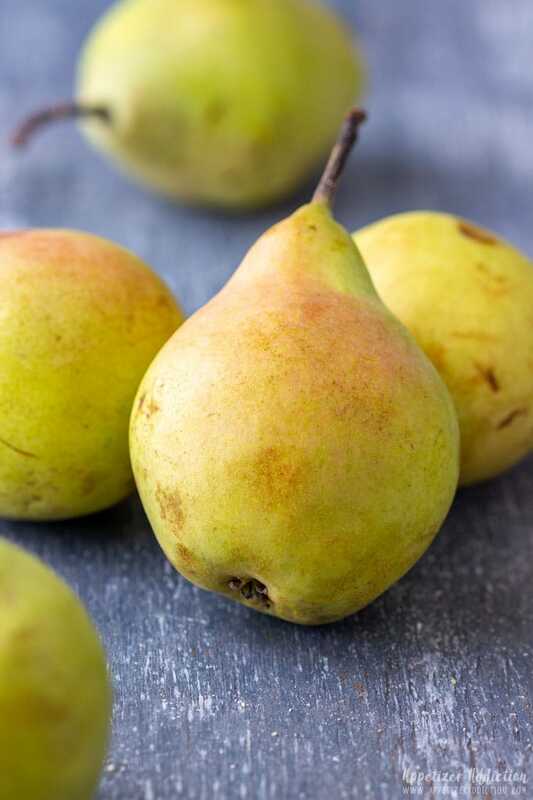 To stop the pears from turning brown, you can drizzle some lemon juice over. Don’t worry you won’t taste the lemon. You can substitute hazelnuts with walnuts. These crostini toasts are best served right away but can be kept at room temperature for up to 5 hours. Just note that the longer they sit the softer they get. If you like more nuts, increase the amount in the recipe. Use any soft goat cheese of your choice. I used President brand. Get all the latest recipes straight to your inbox! This will become my favorite appetizer this season. What a nice combination of pears and goat cheese. I want this for lunch today! They look so good! Love the pear and goat cheese combo! 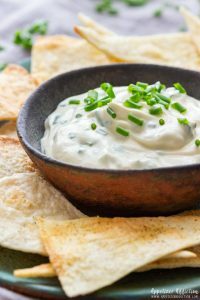 These are the perfect appetizer! I love the pear and cheese together. It’s one of my favorite flavor combos too :)! 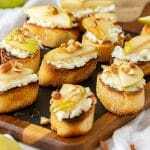 Crostini is one of my favorite appetizers and I just love this pear and nut recipe that you’ve devised. Thank you so much! Oh my goodness this look absolutely amazing! Yummy! 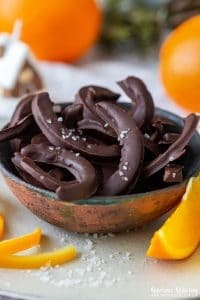 Looks super easy and full of ingredients my family loves. Looking forward to trying soon.